Traveled by air lately? Not really an inspirational experience, eh? After spending what seems like forever going through security (where you have to remove your shoes, and maybe have security people poke you with a handheld scanner), you finally get to board an overcrowded plane. Assuming your flight hasn’t been cancelled, of course. If you get hungry, good luck. Maybe they’ll sell you some stale peanuts. Harried travelers may find it hard to believe, but flying once seemed daring and romantic. When the Wright brothers made their first flight at Kitty Hawk in December 1903, they unleashed the imaginations of would-be adventurers everywhere. The Aviation Cocktail was invented not too long after that — perhaps to celebrate humanity’s conquest of the skies. The drink has a clean, sophisticated flavor that evokes a glorious past. And unlike air travel, it still seems fresh and exciting. Not to mention civilized. Although the first written recipe for The Aviation was recorded in 1916, the drink actually dates back to 1911 — or so cocktail historian extraordinaire David Wondrich tells us in his book, Imbibe. Good as this drink is, it’s not well known. Like The Last Word, The Aviation fell out of favor in the second half of the 20th century, only to be revived by cocktail enthusiasts in recent years. 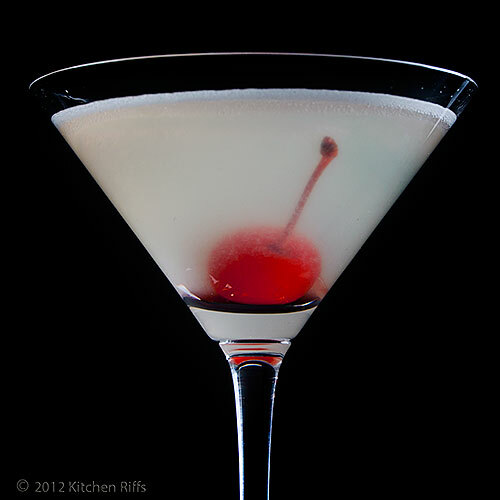 The drink contains gin, lemon juice, and Maraschino liqueur. That last ingredient is a clear liquid with a slightly bitter flavor — the polar opposite of the red juice that sweet maraschino cherries are packed in (so the two are definitely not interchangeable). The original recipe also contained a bit of Crème de Violette, a purplish liqueur flavored by the flower of the same name. This ingredient was dropped from the drink by the 1930s (in part because Crème de Violette became hard to find). It’s not part of today’s standard recipe, though some people insist it should be (in the Notes, I provide a recipe that includes it). Because The Aviation contains citrus juice, it is a “sour” (that is, a drink in the same class as a Whikey Sour or a Classic Daiquiri). As with any sour, you may want to adjust the ratio of citrus and liquor to match your taste. I think David Wondrich’s recipe for this drink is perfectly balanced, and his is the one I use here. This recipe provides one serving, and takes about 5 minutes to prepare. Combine all ingredients (except garnish) in a cocktail shaker half-filled with ice. Shake vigorously for 20 to 30 seconds, until the drink is cold. 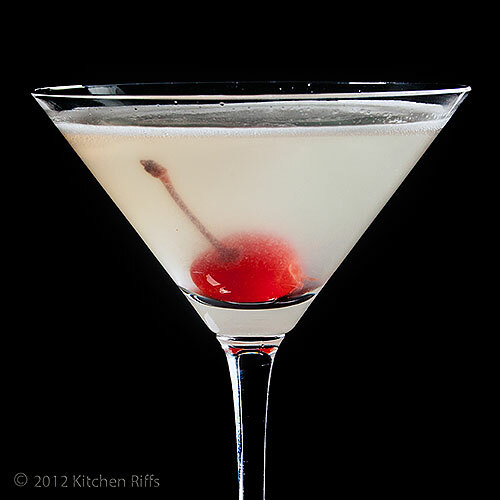 A maraschino cherry or lemon twist is an attractive addition (though I often serve this cocktail without a garnish). Because this drink contains citrus, you should shake it to mix thoroughly. Citrus will make the drink cloudy, so the bubbles you generate by shaking won’t matter, and shaking is the best way to incorporate citrus into a cocktail. For more info on when to stir and when to shake, see Cocktail Basics. 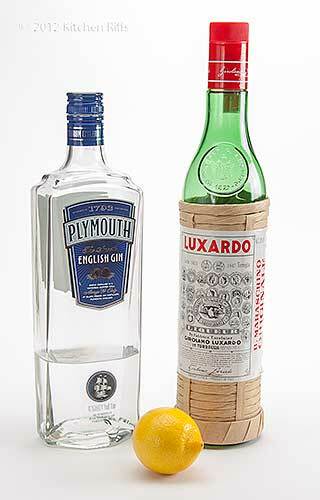 Some recipes call for 2 ounces of gin, and ½ ounce each of lemon juice and Maraschino liqueur. I don’t like the balance of this, but you might. Robert Hess has a nice video with instructions on how to mix The Aviation. He uses Crème de Violette in his version: 2 ounces of gin, ½ ounce Maraschino liqueur, ¼ ounce Crème de Violette, and ½ ounce lemon juice. Crème de Violette does provide a lovely lilac tint. But I think the drink tastes better without it. And it’s not an ingredient I have much reason to use otherwise, so I’ve decided not to stock it in my liquor cabinet. Maraschino liqueur is Italian, and is made from Marasca cherries, including the crushed cherry pits. As noted above, it’s not the sweet stuff you put on ice cream! Lol, cute story and great cocktail! Sounds refreshing! And I really like the white background photo. Cookies and Cocktails. It has a nice ring to it. Flying is definitely not the glamorous experience it once was, that's for sure! This cocktail looks fabulous!! I've got this cocktail in my editorial calendar for mid February; my father was a pilot in WWII and I thought it would be fitting to do a tribute to him on his birthday with this cocktail. I've yet to pop for the Crème de Violette and now maybe just might consider I don't have to! Love the little cherry in the bottom - so cute :) Great photos! Oh the dreaded middle seat. If you want to hark back to yesteryear, fly first class with Emirates or Singapore Airlines or even JAL. I never got an aviation cocktail though - nor did I ask for one. :) This looks so pretty. Hi Alyssa, ;-) Glad you enjoyed it, and thanks for commenting. Hi Abbe, I like the sound of Cookies and Cocktails too! Thanks for the comment. Hi Ali, it's really a refreshing and tasty cocktail. And alas, flying really has become like going to the dentist. Thanks for the comment. Hi Amy, no joke about airport security - it's become thoroughly unpleasant. Cocktails all around! Thanks for the comment. Hi Marina, Mrs K R and I do have a bit of fun, I must admit. And you're right that one should have this cocktail before security! Thanks for the comment. Hi Barbara, I'm usually a stickler for using obscure ingredients, but just couldn't bring myself to use Crème de Violette. Although I suspect at some point in the future I'll break down and try it. Your post will be a great tribute to your dad. Thanks for the kind words, and the comment. Hi Christine, the cherry does look cute, doesn't it? ;-) Which is the main reason I included it! Thanks for the kind words and the comment. Hi Maureen, I was never lucky enough to fly any of those airlines, but back in the day even most of the US lines had quite good transatlantic service. Now flying is pure drudgery, alas. You definitely should try an Aviation sometime if you have a chance - it tastes even better than it looks. Thanks for the comment. I love your conversations with the Mrs. - they're always so entertaining! Cheers to you both, and to your delicious cocktail! Flying economy is pretty ghastly depending on the plane but this cocktail would help ease the pain. Delightful story! Your aviation cocktail looks perfectly delicious! I love your posts. They're so interesting. My husband loves gin, so this drink is for him, that's for sure. I didn't even get pretzels on my last flight. Sigh. When I landed, I could have used one of those Aviations. LOL But I settled for bottled water. Hi Kristy, thanks for the kind words (and for commenting)! I always find those conversations a lot of fun, too, as does Mrs K R! Hi Suzanne, all flying has become ghastly (good word, and not one I see used often enough!). But one or two of these would certainly make the experience better! Thanks for the comment. Hi Judy, it's a great cocktail! Thanks for the kind words, and the comment. Hi Kristin, if your husband likes gin, this is right up his alley - it's a great drink. Thanks for your kind words, and for commenting. Hi Carolyn, flying has become awful, hasn't it? One of these would be great after a flight! Although one gets so dry, bottled water is often more refreshing. Thanks for the comment. Sounds like a delicious cocktail. I will be flying next week, too bad they won't serving this on the flight. Hi Dawn, sorry you won't have this on next week's flight! Maybe afterwards? ;-) Thanks for the comment. I think it's perfect for your series! I just dropped the hubby off at the airport and I'm sure he would love one by the time he gets halfway to his destination. I used to be a huge gin lover, but somehow moved over to bourbon and vodka. IF I can find the maraschino liquor this would be a very interesting drink to try. It seems quite simple and I love gin and citrus. So there you go. Thanks for another great cocktail and history lesson John! Hi John, this cocktail isn't going to be everyone's cup of tea, I know (a lot of people don't like gin). It is a great looking cocktail, I agree. Thanks for commenting. Hi MJ, I'm sure he would! Heck, these days just thinking about having to fly gets me looking over at the liquor cabinet! Finding the Maraschino liqueur can be difficult — not every liquor store is going to carry it. But it's a really good drink. Thanks for the comment. Hi Lizzy, I'm sure you wouldn't actually "need" this cocktail when you fly, but it'd be fun to have! Thanks for the comment. I get air sick so I don't do alcohol during flight however, once my feet hit the tarmac I'm ready to hit the bar. A deliciously refreshing combination with your chocolate pepper cookies! Beautiful photos! Hi Rebecka, it's so easy to get dehydrated while flying that avoiding alcohol is probably a good idea while aloft. But back on the ground? The way most flights are these days, some recovery is needed! And yes, this drink would go quite well with the Chocolate Pepper Cookies! Thanks for the comment. Ah, the good old times... A fantastic retro beverage. So refined and pretty. As much as I love to travel, I must admit that flying (and airports, and security lines) add a lot of stress to the equation. I just keep reminding myself what a privilege it is to travel - then I cross my fingers and hope to get there and back without too many problems. Hi Rosa, the good old times indeed! Isn't this such a nice cocktail? Thanks for your comment. Hi Bam, I'm glad you enjoy Mrs K R's contributions! And a double probably is the most appropriate prescription. ;-) Thanks for the comment. Hi Beth, isn't it pretty? Travel is actually comparatively inexpensive and quite speedy, but the hassle factor is out of this world. We've actually cut back on flying on pleasure trips simply because the whole experience (especially the way airlines seem to go out of their way to alienate their customers) is unpleasant. Thanks for your comment. I love this post. I have never tried Maraschino liqueur before, but that sounds really delicious! Hi Frank, yeah, that knee problem is ridiculous! The airlines really pack us in, don't they? Thanks for the comment. 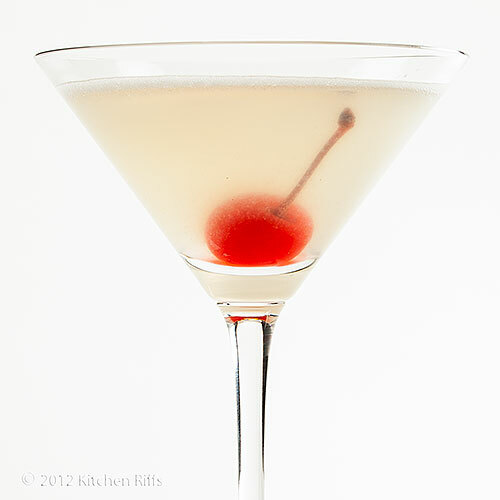 Hi Kristi, Maraschino liqueur is pretty good on its own, but IMO it really shines when used as an ingredient in a drink. It's really worth trying sometime. Thanks for the comment. Hi Nami, Mrs K R and I are rather fond of each other, and I guess it does show in these dialogues. ;-) Plus they're fun! And isn't this cocktail gorgeous? Thanks for the comment. gorgeous drink! your presentation is ALWAYS so lovely! Hi cakewhiz, isn't it a pretty drink? Thanks for your kind words, and the comment. Hi Charlie, those middle seats are killer — totally the worst. I prefer sour drinks, too. And as you say, flying used to be glamorous, but those days are long gone, alas. Thanks for the comment. Such a pretty picture! I'm funny because I still get excited at the thought of flying, despite all the inconveniences now days and the hassle - it's just fun for me to experience new horizons! Your picture should be in a magazine! Hi Terra, those dialogues are fun to write! Probably the reason this drink fell out of favor is Maraschino liqueur fell out of favor — and sometimes it's rather difficult to find (not every liquor store will have it). But it's worth looking for, because this is a terrific cocktail. Thanks for the comment. Hi Chris, with the great photos your husband takes, your compliment truly means a lot! Thanks so much! Hi Raymund, it'd be great if they'd serve this on airlines! It really is a nice cocktail. Thanks for your comment. I love the resurrection of these lesser known cocktails John. You are right, the age of travel has changed markedly and the glamour gone with it. Can you actually get peanuts on a flight anymore?! Brilliant job highlighting this unique cocktail and as always your photos are stellar. I was a bartender for years but I just missed out on all the fun cocktails that have started to be pushed by mixologists. Never heard of this but sounds like a great mix. I'm super interested in the Crème de Violette; never heard of it and I'd love to give it a shot. What's its flavor like? Hi Toni, too about about travel been such a drag these days, because it's always fun going to new places. Thanks for your kind words, and comment. Hi Food Jaunts, I've never tasted Crème de Violette by itself, just as an ingredient in cocktails but it seems to add some nice floral notes. If you're interested in old cocktails, you should pick up a copy of Ted Haigh's Vintage Spirits and Forgotten Cocktails — it's a wonderful book. Thanks for the comment.